Obviously, the universe is big - but, just how insignificant is humanity and our world in the big scheme of things? It was Carl Sagan's idea to turn Voyager's camera back toward the planet that launched the spacecraft in order to reveal to that planet's inhabitants their "true circumstance and condition." After much resistance, Dr. Sagan prevailed, and on February 14, 1990, from a distance of 6.4 billion kilometers, Voyager 1 captured this image of our Earth. Here the entire world fills only 0.12 pixel and appears as a tiny crescent of light. The apparent rays of light are not sunbeams, but scattering off the camera's optics, a result of pointing it so close to the Sun. Now one of the most famous images ever taken from space, this humbling perspective of our beloved home is a part of Dr. Sagan's invaluable legacy. 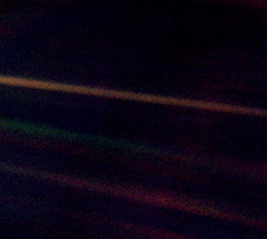 The Earth, near the middle of the top band of light, is barely visible in this scaled down image.